Living on Earth (LOE) - a weekly program on National Public Radio (NPR) that highlights environmental issues. Allen Hatheway was interviewed for the program airing during the week of 23 March 2001. The Nature and Ambiance of Gas Lighting. California Gold Rush Mother Lode resident and gas-lighting enthusiast Paul Ivazes operates a small business at the historic Forty-Niner town of Grass Valley, providing rebuilt and refurbished manufactured gas-era originals and quality reproductions, both fixtures and parts. Paul is a craftsman in the several trades necessary to keep the gas lights burning for those of us who dote on the real and daily reminder of the grand era of manufactured gas. Paul's ambitions include production of a documentary film on the social benefits and impacts of gas lighting, and his path already has produced a nice selection of period illustrations of the lights, their architectural and commercial use, and the general ambiance provided in an era where darkness otherwise pervaded the night. Enjoy Paul's wonderful "Gaswizard's Photostream" site HERE. Railroad Extra - a rail enthusiast site. Included in this site is an excellent historical summary of the manufacture of "Pintsch" gas. 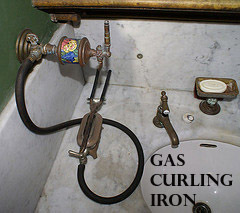 Pintsch was a manufacturing process used primarily in the 19th and early 20th centuries to provide gas service on trains. The gas was usually manufactured in a rail yard facility, and then stored and used on rail cars. Copyright 2019 by Dr. Allen W. Hatheway All rights reserved.